Summary. A 42-year-old hypothyroid shepherd presented with a progressive abdominal lump accompanied by nausea and abdominal fullness. In addition, he had worsening hypothyroidism, despite supranormal doses of thyroxine. Computed tomography of the abdomen was suggestive of a mass lesion in relation to the stomach. 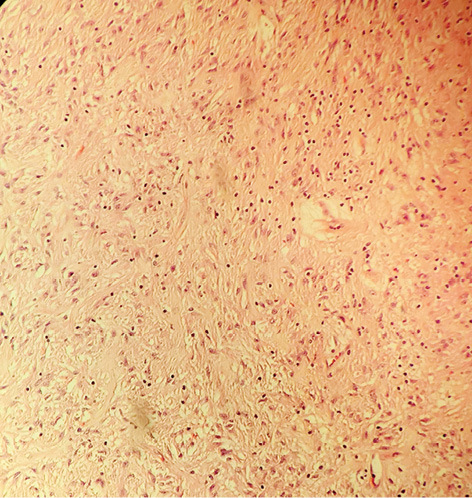 A resection of the mass was done and the histopathology was suggestive of gastrointestinal stromal tumor. After surgery, the patient became euthyroid. We believe the patient had consumptive hypothyroidism due to the tumor. Abbreviations used: GIST — gastrointestinal stromal tumors; T3 — triiodothyronine; T4 — thyroxine; TSH — thyroid stimulating hormone. Gastrointestinal stromal tumors (GIST) are mesenchymal tumors that are believed to originate from the interstitial cells of Cajal or from mesenchymal stem cells present throughout the body. Owing to the physical effects of the tumor, the usual presentation can be abdominal discomfort, bleeding, nausea, vomiting, or early satiety. Very rarely do these tumors present with paraneoplastic syndrome. We report the case of a patient who had hypothyroidism due to a GIST of the stomach, which resolved after surgery. A 42-year-old shepherd was referred to our hospital by his internist with the chief complaints of awareness of a progressive upper abdominal lump for 2 months and postprandial nausea with abdominal fullness for 2 weeks. The patient was a known case of hypothyroidism, and had been on 25 µg of thyroxine (T4) for the past 15 months, but for the past 1 month, his serum thyroid stimulating hormone (TSH) levels failed to return to previous levels despite taking 200 µg of T4. His most recent thyroid profile at the time was, TSH — 49 µIU/ml, triiodothyronine (T3) — 0.37 ng/ml, T4 — 4.3 µg/dl and reverse T3 — 292.4 ng/dl (normal range: TSH — 0.30–0.50 µIU/ml, T3 — 0.60–1.81 ng/ml, T4 — 5.01 to 12.45 µg/dl and reverse T3 — 10–40 ng/dl). The patient had been compliant with medication and follow up. The patient was a teetotaller, and had no history of tobacco use. On examination of the abdomen, there was a 10 × 6 cm intra-abdominal lump present in the epigastrium, extending to the left hypochondrium, umbilical and the left lumbar regions. The lump was firm, non-tender, non-pulsatile, and mobile. Laboratory tests, including a complete blood cell count, blood biochemistry, liver enzymes, and serum amylase and lipase levels, were within normal limits. On computed tomography of the abdomen, a solid mass of size 14.8 × 9.6 cm with heterogeneous non-enhancing low attenuation areas was identified in relation to the stomach (Fig. 1). On upper gastrointestinal endoscopy, a submucosal mass lesion was found in relation to the posterior wall of the stomach, without evidence of mucosal involvement. The patient underwent a distal gastrectomy with retrieval of a gastric mass arising from the posterior wall of the stomach without rupture of the mass during handling (Fig. 2). Other solid organs were normal. No lymphadenopathy or ascites was present. 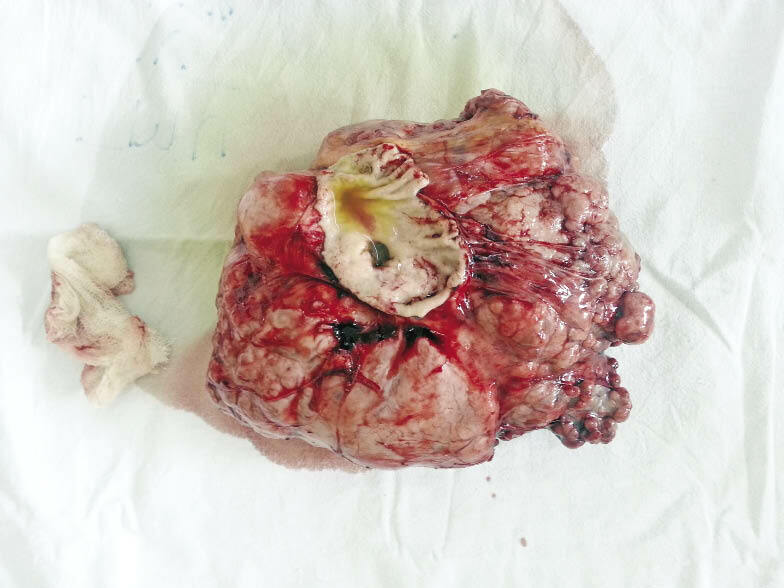 On macroscopic examination, there was a solitary, round tumor measuring 11 × 8 × 6 cm in size. The lesion was well demarcated and had a pseudocapsule. On cut sectioning, the surface was mostly solid with a few cystic areas. Interspersed within were foci of necrosis and hemorrhage. Microscopic evaluation revealed a cellular proliferation of spindle-shaped cells with high nucleus:cytoplasm ratio. Cellular and nuclear pleomorphism was also present. Few areas of necrosis were also seen. Mitotic figures were seen occasionally embedded within areas of increased mitosis (9/50 high power field) (Fig. 3–5). 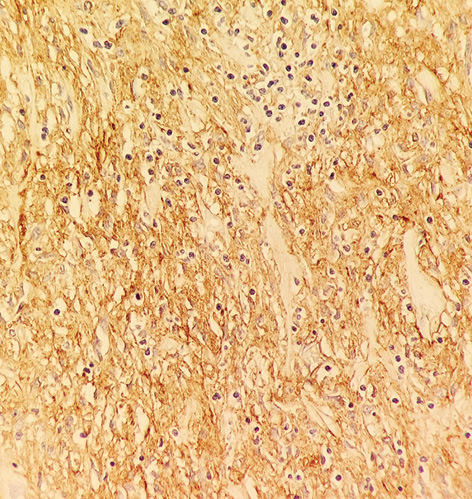 On immunohistochemistry, the tissue was positive for CD117 (Fig. 6), but negative for desmin and S-100. 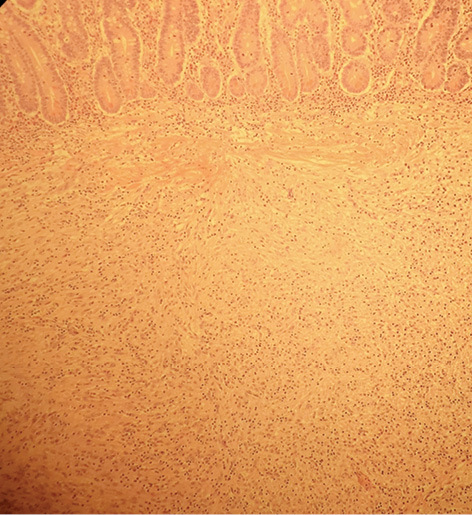 Based on the macroscopic findings (size > 10 cm), histopathology (mitosis > 5/50 high power field) and immunohistochemistry a diagnosis of the GIST of the stomach with a high risk of neoplastic progression was made. The patient had an uneventful recovery and was discharged 3 days after surgery on adjuvant imatinib mesylate. Post-operative thyroid function tests after 6 weeks were, TSH — 3.9 µIU/ml, T3 — 0.74 ng/ml, T4 — 7.2 µg/dl, and reverse T3 — 252.3 ng/dl. After gradual reduction of exogenous T4, the drug has been withdrawn and the patient has been euthyroid since. The median age of GIST presentation is 55–60 years and these tumors represent 80% of all mesenchymal gastrointestinal tumors and 0.1–3% of all gastrointestinal malignancies . About 70% of the patients with GIST are symptomatic, 20% are asymptomatic and in 10% the lesions are detected only at autopsy. The tumor may present as abdominal discomfort, bleeding, nausea, vomiting, or early satiety. Tumor spread is usually intra-abdominal, and metastasis to lymph nodes is rare. Symptoms are usually dependant on the site involved, with the most common being the stomach (60%) and the small intestine (30–20%) . Although rare, paraneoplastic syndromes have been described with GIST. These include autoimmune haemolytic anaemia, hypoglycaemia, hyponatremia, nephrotic syndrome, headache and diplopia [3–7]. A peculiar consequence of GIST is consumptive hypothyroidism. First reported in children with infantile haemangiomas, this condition results from accelerated degradation of circulating thyroid hormone at rates higher than the synthetic capacity of the normally stimulated thyroid gland. In cases of tyrosine kinase inhibitor naive patients, consumptive hypothyroidism is caused by overexpression of the thyroid hormone-inactivating enzyme iodothyronine deiodinase 3. The diagnosis of consumptive hypothyroidism requires evidence of either elevated levels of serum reverse T3 or supranormal requirements for exogenous thyroid hormone . In our patient, the patient’s requirement for supranormal doses of T4 was abolished soon after surgery, thus supporting this diagnosis. On contrast-enhanced computed tomography, peripheral enhancement is present in the 75% of the cases of GIST. 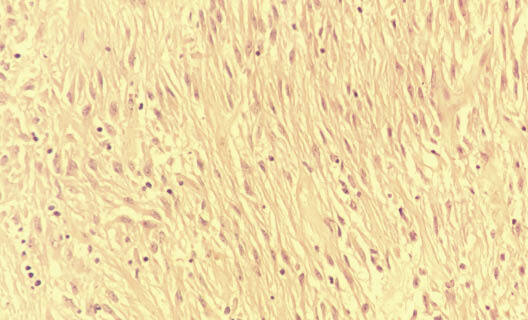 This represents an enhancement of peripheral areas of viable tumor. However, in a minority of patient’s areas of low attenuation may be present corresponding to haemorrhage, necrosis, or cyst formation, as present in our case. We do not believe this is of consequence with respect to consumptive hypothyroidism, as the imaging finding has been described without the paraneoplastic syndrome as well . Surgery has been treatment of choice with 60% of patients being cured by surgery alone. Laparoscopic resection is considered a feasible procedure for patients with gastric GIST 5 cm or smaller, if not contraindicated by comorbidities. Locally advanced GIST may be candidates for surgical resection after neo-adjuvant treatment with Imatinib, a c-Kit inhibitor. In cases of inoperable, metastatic or recurrent GIST, Imatinib remains the first-line treatment [1, 10]. Although hypothyroidism is a frequent clinical scenario, the astute clinician must remember that hypothyroidism can often be the herald of a much more sinister diagnosis such as a GIST. In cases of patients requiring supranormal doses of T4, a measurement of reverse T3 should be considered to establish the diagnosis of consumptive hypothyroidism. Caterino S, Lorenzon L, Petrucciani N, et al. Gastrointestinal stromal tumors: correlation between symptoms at presentation, tumor location and prognostic factors in 47 consecutive patients. World J Surg Oncol 2011; 9: 13. Rammohan A, Sathyanesan J, Rajendran K, et al. A gist of gastrointestinal stromal tumors: a review. World J Gastrointest Oncol 2013; 5: 102–12. Albalawi M, Madkhali I, Nasser H. Autoimmune hemolytic anemia: a rare presentation of gastrointestinal stromal tumor. J Applied Hematol 2012; 3: 89–92. Bodnar TW, Acevedo MJ, Pietropaolo M. Management of non-islet-cell tumor hypoglycemia: a clinical review. J Clin Endocrinol Metab 2014; 99: 713–22. Bonato V, Lalle M, De Mattia G. Paraneoplastic severe hyponatremia in a patient with GIST: case report. Endocrine Abstracts 2012; 29: P451. Guirgis HM, Holcombe RF. A case of advanced gastrointestinal stromal tumor (GIST) presenting with paraneoplastic syndrome. J Clin Oncol 2004; 22 (14 suppl): abstract 4242. Takane K, Midorikawa Y, Yamazaki S, et al. Gastrointestinal stromal tumor with nephrotic syndrome as a paraneoplastic syndrome: a case report. J Med Case Rep 2014; 8: 108. Maynard MA, Marino-Enriquez A, Fletcher JA, et al. Thyroid hormone inactivation in gastrointestinal stromal tumors. N Engl J Med 2014; 370: 1327–34. 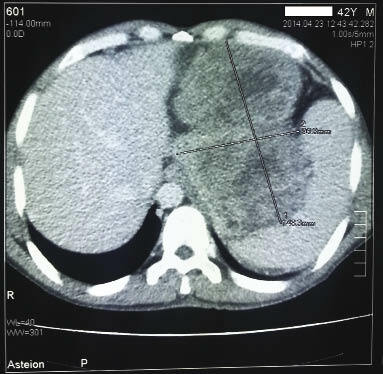 Afifi AH, Eid M. Gastrointestinal stromal tumors (GISTs): diagnostic value of multi-detector computed tomography. Egypt J Radiol Nucl Med 2012; 43: 139–46. Nishida T, Blay JY, Hirota S, et al. The standard diagnosis, treatment, and follow-up of gastrointestinal stromal tumors based on guidelines. Gastric Cancer 2016; 19: 3–14.